Austrian parachutist performs eye-catching 1,500 metre jump over Lake Wolfgang. Paul Steiner has added to his long list of parachuting highlights by landing on the wing of the same plane that he leapt out of moments before in an eye-catching jump. The 55-year-old leapt from the seaplane 1,500 metres over Lake Wolfgang in Salzburg, Austria and landed on the left wing just after it had landed and come to a stop on the water. 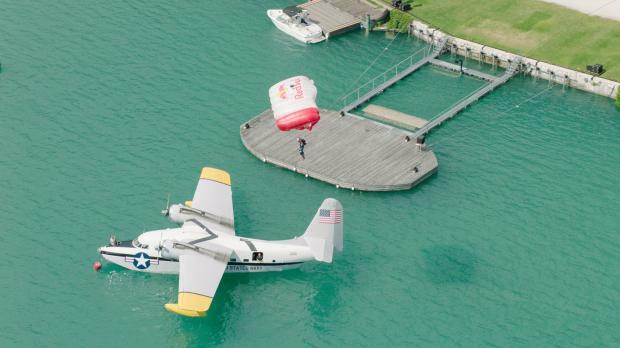 The parachutist has dreamed of undertaking the jump for years and decided to perform it above Lake Wolfgang with a Grumman Albatross, an old US Navy plane. “Jumping out of an airplane is not unusual for a parachutist but to land on the wing of the same aircraft is. I have been playing with this idea for a very long time. During the guest visit of the 1950s-built American seaplane Grumann Albatross at Hangar-7 in Salzburg, I immediately saw my chance to put this dream into action,” he said. The plane in question was piloted by Flying Bulls chief pilot Raimund Riedmann and landed with Steiner soaring just 300m above at that stage. In a precarious landing, Steiner had only a two-metre landing strip on which to come to a rest, and the pull back on his parachute nearly dragged him back into the water but he unclipped his canopy just in time. He celebrated the jump with a punch of the air from the wing of the aircraft followed by a dive into the summer waters below. Steiner has performed a staggering 5,560 jumps, his highest being from 10,100m from a hot air balloon. Other career highlights include a parachute jump into the DO-X Theater of the Hotel Scalaria in St Wolfgang, landing on a hot air balloon and jumping onto a hang glider released by a hot air balloon.